Scuba diving is primarily executed for the attraction of the unreachable and mysterious undersea world. Since the beginning of time, the ocean is the “region” of nature that humanity has not been able to totally control, we simply aren’t capable to breathe underwater by our own means. For that reason, scuba diving gives us an opportunity to be in that world, even if it’s just for a defined quantity of time. SCUBA is an abbreviation for Self-Contained Underwater Breathing Apparatus, in other words, we must use special equipment to allow us to breathe underwater. Equipment for modern scuba diving is made up of one or more gas cylinder secured to the diver’s back. This gas tank is joined to an air hose and the demand or diving regulator, this device controls the flow of air, so that the air pressure in the diver’s lungs is the same as the pressure of the water. Among other gear used in diving is the buoyancy control device (BCD), basically an inflatable jacket that controls your buoyancy by adding or releasing air. The air that is in those tanks is compressed air as we know it outside: parts of nitrogen, oxygen and some other gases as well. Frequently people erroneously believe that the air in the tanks is pure oxygen, but that would only be harmful for the divers. Because of the nitrogen in the compressed air, divers need to be very careful when diving to greater depths, as nitrogen narcosis can occur, which has the same effect as excessive alcohol. This is conveniently figure out by going back up to not so deep open water spots. Learning to scuba dive is actually very easy. Actually, everyone could learn in 15 minutes the basic skills needed to breathe and move underwater. During the professional course, you not only gain knowledge about diving, but also need to learn how to handle the scuba equipment. In addition, you must learn how to prevent and solve problems during immersions. Our Discover SCUBA Diving course is the first step in experiencing the amazing underwater world. This program allows you to take a look at the underwater life on the reefs on Playa del Carmen and Tulum, a famous worldwide diving vacation destination. During this preparatory diving course, your instructor will introduce you to the basic equipment required for your ocean or open-water cenote dive and lead you through the basic things you need to feel secure and pleasant while SCUBA diving by your own. You will then get into the water for the very first time in our pool or shallow water site, so you can get a feel for how easy and relaxing it is to breathe underwater. At this point you will see the beautiful and magical aquatic life that you could never imagine existed and in doing so you will start to understand why scuba diving fascinates all of those involved. You will want to this again and again! After the dive, your instructor will help you identify and name all the exotic sealife you saw during your experience. Discover Scuba Diving is a full day and involves a short briefing, the shallow water session, and one or two open water dives. The experience starts around 9 am and ends around 4:30 pm. This dive counts as the first step in getting your worldwide SCUBA certification, the Open Water Diver Course. 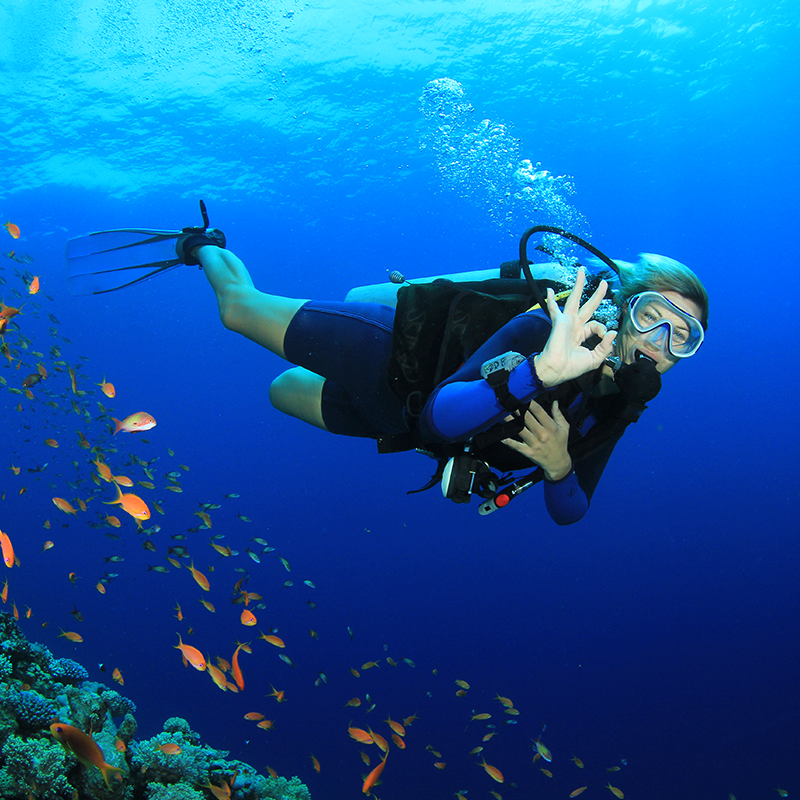 The main benefits of scuba diving to general physical fitness were acknowledged by the 2011 Compendium of Physical Activities, which compared it in terms of metabolic activity involving ice-skating, power-walking and casual soccer for mention some of them. On average, a man weighing about 180 pounds/81.6 kg can expect to burn as much as 600 calories during an hour dive, and many more if swimming in strong currents or particularly low temperature water. Scuba diving workout is valuable not only as a practicable way of physical exercise, but also for mental and emotional well-being. The peace, calmness and grace of the underwater world and it’s wildlife, encourage positiveness and give real delight to those who experience them. Diving is a great way to strength and build up your body, burn calories and boost your serotonin levels, ultimately making it both a rewarding, enjoyable way to keep fit and happy. All scuba diving students must answer a medical form before beginning a diving course. The high pressure a diver experiences underwater effects how his body functions in a variety of ways. Physical conditions that may not be inconvenient, or even notable, in everyday life may be dangerous underwater. Lung problems (such as asthma), ear issues, allergies, and certain diseases are all potentially dangerous under the sea. Some medications are contraindicated for diving. People with the desire of dive should carefully read, and then honestly answer the diving medical questionnaire before starting the program, and they should review it periodically throughout their diving careers.